A summer of training and teaching in a district summer science school program launched the year for four College of Education students who were the inaugural Storer Scholars cohort. Mariel Pfiefer, Camille Hawkins, Mary Goetz and Ashley Allen were selected at the end of the 2011-12 academic year, from a competitive pool of more than 20 applicants. 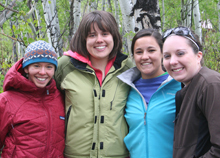 The Storer Scholars began their journey in May 2012, at a one-week training program at Teton Science Schools (TSS). Their focus was on outdoor, place-based, science education. In July, they taught a week-long Summer Science School for Carbon County School District 2 in Saratoga. The scholars worked with 58 elementary students, grades K-6, under the tutelage of TSS instructors Andy Solomon and Stephanie Lewis. At the conclusion of that event, parents and students completed an evaluation of the experience. Of the total group, 93 percent reported an increase in science literacy. The four scholars reflected on their experiences and reported similarly positive outcomes. All four reported being more comfortable teaching outdoor, place-based science by the end of the summer experiences. The second Storer Scholars cohort was selected in spring 2013: Andrea Leiferman, Jennifer Andersen, Katie, Guerrieri, and Rebekah Taylor.